A cream tea with freshly baked scones is one of summer's most enjoyable treats. 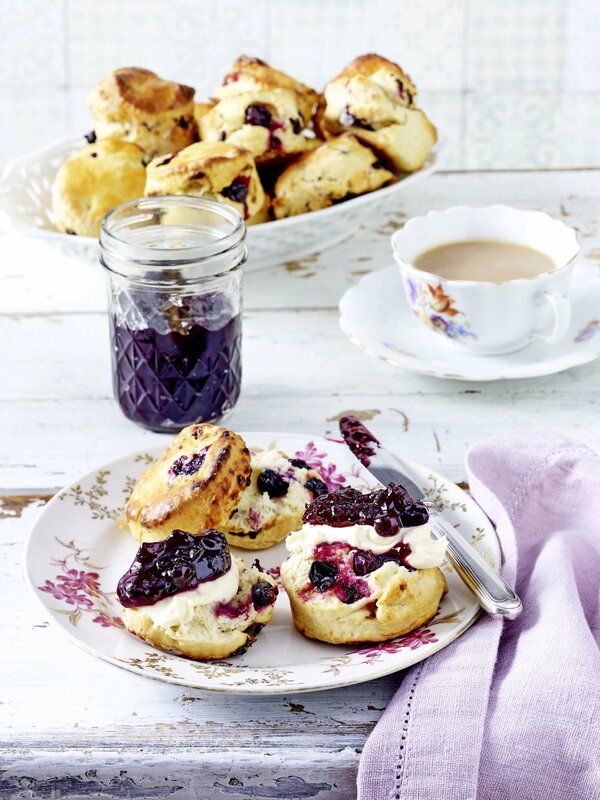 In this recipe, the scones are enhanced with the sweet and earthy blackcurrant, dolloped with cream and blackcurrant jam. For the jam: Place the blackcurrants in a 2.5 litre saucepan and cover with the sugar. Add the water and stir thoroughly. Cook on a low heat for 10 mins, stirring occasionally. By then, the fruit should be producing liquid. Simmer for a further 10 mins on low until a liquid forms properly and the sugar has dissolved, then bring to the boil. Hold on the boil, stirring occasionally, for 10 mins until the mixture thickly covers the back of a wooden spoon. Sterilise four clean 400g glass jars and lids: cover the lids with boiling water in a bowl for 2 mins, then drain, and pour 20ml of boiling water into each jar, then discard the water. Allow the jam to cool for 5 mins, then pour into the jars while hot. A funnel will make pouring easier. For the scones: Preheat the oven to 220°C/gas mark 7. Sieve the flour into a large bowl. Add the butter and rub it into the flour by pinching together with fingers and thumbs. Stir in the caster sugar. Add the milk and blackcurrants, then bring together into a dough using the hands. Knead gently within the bowl for 1 min. On a clean surface dusted with flour, roll out the dough to approximately 2cm thick. Using a 6cm fluted cookie cutter, cut out as many scones as possible, transferring them to a flat oven tray, dusted liberally with flour. Roll out the remaining dough again and repeat the process until there are 12 scones. Brush with milk and sprinkle with sugar, then bake for 15 mins until golden. Allow to cool slightly on the tray, then transfer to a wire rack to cool completely. To serve, cut in half and top with a spoonful of clotted cream and the blackcurrant jam.